Most people start off the new year with resolutions to improve themselves in one or more ways. Unfortunately, well before January is over, most of those resolutions fall by the wayside. That’s why I stopped making major resolutions a long time ago. Now, when I’m not happy with where I am in life, whether it be my health, career, or family life, I make small promises to myself that I know I can keep. Self-improvement doesn’t have to be a lofty ideal we can’t actually achieve. It’s easy if you approach it using the 60-second rule. Why Does the 60-Second Rule Work? If any of you has ever tackled the P90X workouts, I’m sure you’re familiar with Tony Horton’s mantra “You can do anything for 60 seconds” as he motivated you to finish an exercise. Well, I realized that this attitude serves me well in areas other than just exercise (though it’s extremely effective in that area too). If I’m feeling unmotivated to do chores around the house, I commit to only 60 seconds. Rather than tackling vacuuming the whole house, I decide I will just take the 60 seconds to get the vacuum out and plug it in. Chances are, once I’ve gone that far, I will go ahead and start vacuuming. However, if I am still unmotivated to clean, I don’t feel defeated since I’ve met my meager goal of getting ready to vacuum. A little later, I’ll challenge myself again to just START vacuuming (for only 60 seconds of course). At that point, I will definitely get the job done, even though it will undoubtedly take me longer than 60 seconds. I’ve taken a pretty long sabbatical from my blog. One 60 second commitment is all it took to get me back into the groove. I simply promised myself I would spend 60 seconds starting my editorial calendar for this year. Several hours later, I had the whole year mapped out, two posts published and another two posts written and scheduled. I simply needed to force myself to sit down and focus on work to get it done but I was only able to convince myself to do it when I made the commitment a very small one I knew I could honor. 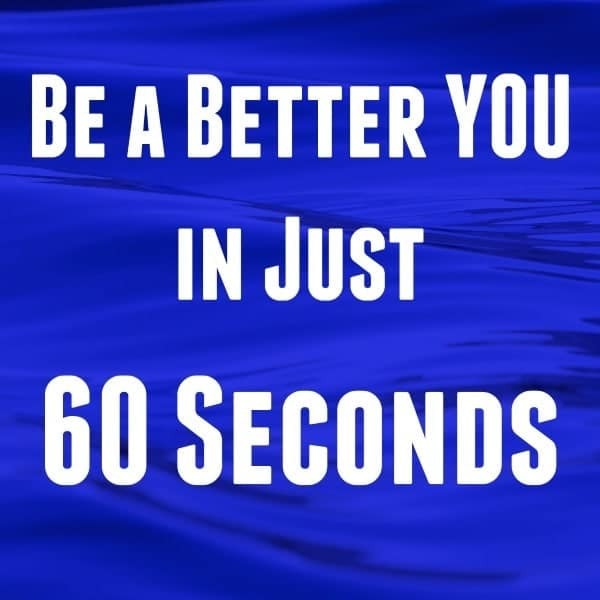 The 60-second principle works for diet too. Craving a cookie? Make yourself wait for 60 seconds before you can eat it. Better yet, use that 60 seconds to drink a glass of water while you wait. After the 60 seconds, if you still want the cookie, try another 60-second delay but this time use that 60 seconds to do a small task (e.g. start a load of laundry) or an easy exercise (e.g. walking in place). If you’re anything like me, about half the time you will get distracted during your 60 seconds and forget about the cookie or, talk yourself out of the cookie completely. I’m sure most parents have had to calm themselves by counting to ten. We do it because it works. If you take a few seconds (say 60) to pause before you address your little one who has just drawn a self-portrait on the family room wall in marker, you’ll run a far better chance of keeping your cool and delivering a sentence you can easily carry out as opposed to the knee-jerk reaction you might otherwise have had to perhaps scream obscenities and threaten to ground your child until 2050. The beauty of the 60-second commitment is that, because you can do almost anything for just one minute, you can be meeting and exceeding your goals all day, every day. This is lasting self-improvement made easy. That positive, uplifting feeling is what will keep you looking ahead and aiming higher. Our usual goals that require a long-term commitment (e.g. lose 15 pounds, get a promotion, make the house showroom quality) don’t grant us instant satisfaction and any lack of progress towards meeting those goals makes us feel defeated or deflated, the ideal mental state for apathy, or worse, destructive behaviors. By breaking those larger goals down into easy-to-achieve 60-second goals, you’ll find you will achieve far more with far less frustration along the way. I love this idea. I have done this in a similar way by “setting the timer” but usually it is for longer than 60 seconds. I think getting started is often one of the hardest parts! Great post. Thank you for sharing. What a brilliant concept! I’m definitely going to give it a try. Sometimes just getting started is the hardest part. The 60 second commitment is brilliant! And I’m so glad you’re back to blogging, I’ve missed you, Corinne. Susan, thank you so much for stopping by! I have missed being online and now that I am back can’t figure out why I ever took the break. I’m looking forward to connecting with all my online friends again and learning from their amazing insights.